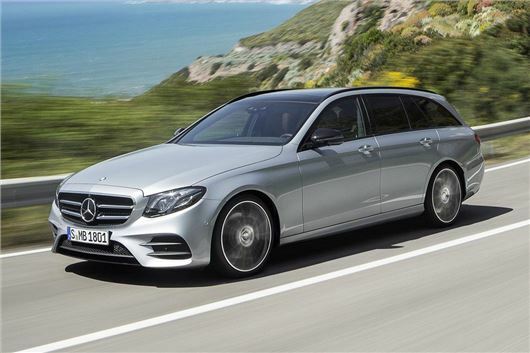 The Mercedes-Benz E-Class Estate is available to order now, with a starting price of £37,935 for the entry-grade E 220d in SE trim. Moving up to AMG Line trim increases the price to £40,430. Initially only the 220d engine will be offered, but the six-cylinder E 350d and AMG E 43 will arrive in the UK in October. Prices for the E 350d and E 43 are to be announced but we expect them to cost from around £39,000 and £58,000, respectively. The E 220d uses an all-new four-cylinder turbo diesel with peak power of 194PS and peak torque of 400Nm. It comes with a nine-speed automatic transmission as standard and has an official economy figure of 67.3mpg. Emissions are from 109g/km. Standard equipment on SE models includes Garmin navigation, power tailgate, Park Pilot self-parking, reversing camera, LED interior lighting with 64 colour choices, keyless go, heated front seats and DAB radio, along with two-zone climate control and leather upholstery. AMG Line costs an additional £2495. Changes over SE are largely cosmetic and include 19-inch alloy wheels, AMG exterior styling, black ash wood interior trim and various other AMG details. Options include a variety of packages, with features like multibeam LED headlights, active lane keep assist and Burmester audio. The Drive Assistance Plus package costs £1695 and combines Steering Pilot, Distance Pilot Distronic and Speed Limit Pilot to provide semi-autonomous driving, with cruise control that follows the lane and adapts to the speed of the car ahead and to speed limit changes.